There are several families (some related - some not) that I wanted to give a gift to. Problem: Not enough money to buy everyone an individual gift. Some of the families have as many as 5 members in them, and if I could find a gift for each one at $15 a piece the total cost would have been somewhere around $75...realistically speaking the cost would have been much higher because it's not easy to find a nice $15 gift for everyone! I really wanted to give them something....so I came up with a family gift idea. The above bag was filled with items the whole family could enjoy -- while catering to their specific tastes. 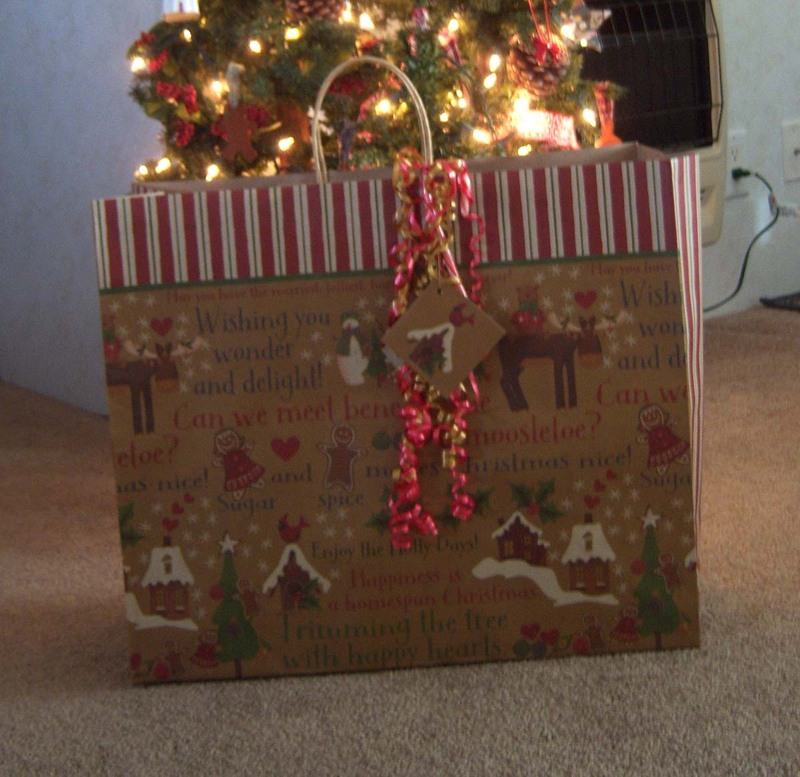 The recipients were surprised and acted like they really enjoyed their gifts. BTW - the total cost for one gift (including the $2.50 gift bag) was somewhere around $23 --- give or take a little depending on the items included. You are right what a great idea! It also tells that family that they mean enough to you that you took the time to search out their favorites. 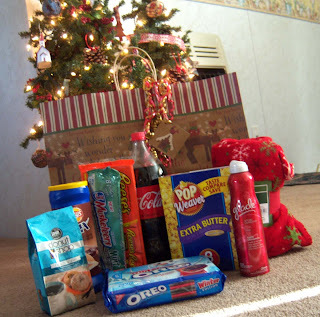 When money was tight with my parents one year, my mom got the great idea to wrap up candy and soda and other treats to supplement the one toy they were able to afford for the kids. No one was the slightest bit disappointed. We though it was great! Terrific idea! Love giving gifts that you know will be used. I always liked designing gift baskets, too. And, your 11-29 post about the tradition of crafting after Thanksgiving dinner is precious! What a wonderful and memory making tradition to share - and produce keepsakes tied to special moments with loved ones! Thanks for visiting my place - hoping to get more in the swing of blog reading in the new year - my job has been like a prision! I love these kind of gifts. It's a great idea to combine gifts. We put so much pressure on ourselves to purchase gifts we can't afford which in turn puts pressure on them because they can't afford it either.